We’d love your help. 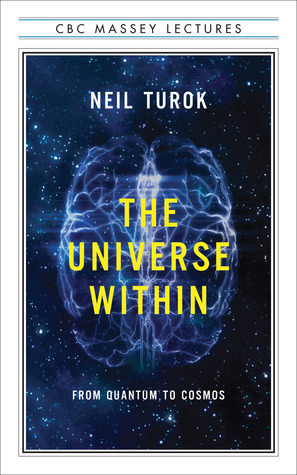 Let us know what’s wrong with this preview of The Universe Within by Neil Turok. The most anticipated nonfiction book of the season, this year's Massey Lectures is a visionary look at the way the human mind can shape the future by world-renowned physicist Neil Turok. In this personal, visionary, and fascinating work, Neil Turok, Director of the Perimeter Institute for Theoretical Physics, explores the transformative scientific discoveries of the past three centuries -- from classical mechanics, to the nature of light, to the bizarre world of the quantum, and the evolution of the cosmos. Each new discovery has, over time, yielded new technologies causing paradigm shifts in the organization of society. Now, he argues, we are on the cusp of another major transformation: the coming quantum revolution that will supplant our current, dissatisfying digital age. Facing this brave new world, Turok calls for creatively re-inventing the way advanced knowledge is developed and shared, and opening access to the vast, untapped pools of intellectual talent in the developing world. Scientific research, training, and outreach are vital to our future economy, as well as powerful forces for peaceful global progress. To ask other readers questions about The Universe Within, please sign up. Certain things just make Canadian public broadcasting awesome, and the Massey Lectures are one shining example. For one week, since 1961, with a few exceptions, CBC radio has broadcast annual lectures on a topic from philosophy or culture by notable figures. These lectures now get published in book format. Douglas Coupland’s most recent novel, Player One , is an adaptation of the lectures he gave in 2010. Now Neil Turok, a noted physicist and current director of the Perimeter Institute, has had Certain things just make Canadian public broadcasting awesome, and the Massey Lectures are one shining example. For one week, since 1961, with a few exceptions, CBC radio has broadcast annual lectures on a topic from philosophy or culture by notable figures. These lectures now get published in book format. Douglas Coupland’s most recent novel, Player One , is an adaptation of the lectures he gave in 2010. Now Neil Turok, a noted physicist and current director of the Perimeter Institute, has had a go. With The Universe Within, Turok brings the very big and the very small to the forefront of public consciousness as he looks at cosmology and quantum physics and where science and society are going from here. Just as the Massey Lectures themselves excite me, so too do books on science. There’s just something so decadent about sinking into a good book explaining how the world works, and how we know this how the world works, and of course, all the affairs and scandals the people who learned how the world works had while learning it! Science and the history of science are intensely fascinating concepts. Turok has done his best to recap the better part of twentieth-century physics, with brief trips further into the past to bring us the origins of scientific thought in Anaximander and Pythagoras’ Greece. The links that Turok draws between quantum mechanics and cosmogony are interesting. The classical big bang theory and its inflationary addendum are the most well-known origin theories, but they have their drawbacks. Most notoriously, the big bang theory inevitably results in a singularity at time zero—a point where our mathematics are unable to make sense of the initial conditions of the universe. We can explain what happened 10^(-43) seconds after the beginning of the universe, but not what happened at the beginning. That’s why some physicists, Turok included, are championing a cyclical theory of big bangs —and they are hoping quantum mechanics will help them prove it. Cyclical big bang theory side-steps the singularity problem through clever theorizing and equally clever math. It also offers an answer to another nagging physics problem: fine-tuning. Physicists have, since the middle of the twentieth century, been able to summarize all of physics quite concisely. In fact, they can do it with a single, beautiful equation. It involves quite a few constants whose values have been measured or calculated to great precision—but we don’t know why the constants have those values, other than that if they didn’t, we wouldn’t be here. Hence the anthropic principle : the universe is the way it is because if it weren’t, we wouldn’t be around to see it. The cyclical big bang theory negates the need for the anthropic principle, because it sees the birth and destruction of infinitely many universes. Of course, having a theory and sensible is one thing. Having evidence is quite another, and that’s what Turok needs next. I knew that gravitational waves are a predicted but not yet observed phenomenon of general relativity. I didn’t know that detecting long wavelength gravitational waves in the cosmic background radiation would lend strength to inflationary theory! It’s cool to find out how some of the experiments currently being conducted could affect contemporary competing theories. On a related note, this might be one of first books to note the discovery of the Higgs boson by the Large Hadron Collider. Turok doesn’t mention that the Higgs’ existence hasn’t been officially acknowledged; we’ve detected a particle that is almost certainly what we’d call the Higgs boson, though we still need a little more data to call it a day. But I forgive him because he’s probably very excited. So am I! In the last part of the book, Turok shifts focus from cosmology to computer science. He explains the role of physics in developing computing and pays particular attention to the possibilities that might open up if we get quantum computing working. With a brief detour into Teilhard’s Omega Point and some name-checking of Marshall McLuhan, Turok settles down to discuss some of the difficulties facing us in pushing science to that next level. I sense that this is supposed to be the most important and profound part of the book, but it comes off as the weakest and least substantive. After an interesting hundred pages on the history of physics and the origin of the universe, the last chapter is a mixture of blue-sky enthusing for the future and realistic evaluations of our current challenges. In the end, it didn’t really leave me excited or inspired, though I certainly found the book informative and sometimes entertaining. The Universe Within is part cosmology, part history, part philosophy. The first two are excellent in every respect. The last part has its moments but doesn’t quite integrate with the rest of the book. Perhaps this is a result of its adaptation from lectures, for the entire book has moments where it seems to lack focus or direction. Turok is at his best when he is explaining the link between history and physics—the how we know what we know part—and for that alone, this is a good book to read. Some background: I attended the Calgary Massey lecture (chapter 4 of the book)and have a degree in Chemistry and I consider myself reasonably comfortable with quantum mechanical theory. The good: I really, really enjoyed his potted history of physics. He does a good job of explaining complex ideas in accessible terms. His overall style works. The bad: Nearly half of the Calgary lecture (this book is essentially the transcript, so half of chapter 4 and good portions of other chapters) are autobiogr Some background: I attended the Calgary Massey lecture (chapter 4 of the book)and have a degree in Chemistry and I consider myself reasonably comfortable with quantum mechanical theory. The bad: Nearly half of the Calgary lecture (this book is essentially the transcript, so half of chapter 4 and good portions of other chapters) are autobiographical and discussions of the state of science learning in Africa. He advocates hard for the idea that the next Einstein could be anywhere, so developed nations should be doing something to encourage high science in developing countries. Don't get me wrong, people everywhere in the world are smart, clever, insightful, driven, etc. But there are more pressing needs (economic and political stability, clean water, universal *basic* education, immunizations, food security to name a few) that need to be addressed before the population of any nation can even start grooming and supporting ultra-specialists like scientists. The other bad: not so much bad as an unfortunate consequence of the subject material is that sooner or later the ideas become incomprehensible. I imagine a lay reader finds very nearly everything about quantum mechanics bizarre and completely incompatible with their understanding of the world. I made it most of the way through before I couldn't internalize the concepts in a way that made any sense to me at all. It appears that those seeking answers to the big questions around ontology and epistemology are more likely to be found in physics than philosophy. Neil Turok is the Director of the Perimeter Institute in Waterloo, Ontario and a protégé of Stephen Hawking (who is also on faculty at the Perimeter Institute). This book represents the Massey Lectures for 2012. I began with great hopes that I would emerge with a better understanding of modern physics, but found the first half of the book almost impenetrable. Mind you he avoided any mathematics (ok there is one equation), but I think sometimes those who live in the world of advanced mathematics, and who try to explain it to the rest of us, are like the Korean/Chinese/Japanese workers who wrote the assembly instructions and directions for our appliances...sometimes baffling…sometimes infuriating. With persistence it is possible to glean quite a lot from the book however. I particularly appreciated the historical review of physics in the 20th century. Planck-Maxwell-Bohr-Einstein et al were names learned in high school physics, but I did not appreciate how it all fits together until now. Just as Maxwell unified electricity, magnetism and light, Einstein unified space, time, energy, and gravity. To quote Einstein: ”Before Maxwell, physical reality was thought of as consisting of material particles…Since Maxwell’s time, physical reality has been thought of as represented by continuous fields.” Einstein equated mass and energy. The current debates about the models of the universe and its origins was helpful to read. In considering ontological questions like this, what distinguishes physics from philosophy is that the physicists seek experimental proof of their models. Nevertheless, I find it very difficult to understand concepts such as space-time, or that gravity is the bending of space time, by matter. Unless, one is steeped in the mathematics behind these concepts, they seem quite distant from our day to day reality. This reminded me of Neil Stephenson’s futuristic novel, Anathem, which portrays a time when those with advanced mathematical understanding are housed separately from the remainder of society. Really 4 1/2 stars, because the author is repetitious in some parts. Loved this book. Although it was right at the edge of my ability to understand parts of it, it was fascinating. Every 10 years or so, I like to catch up with the latest developments in the quantum world. This book is based on this year's Massey Lectures, a Canadian institution that always delivers an in-depth, thoughtful look at an interesting topic by a speaker who is knowledgeable and good at communicating. This latest look a Really 4 1/2 stars, because the author is repetitious in some parts. Listened to the final brilliant lecture today. Loved it! I've never been good at physics, unfortunately, but this book gives me hope. Wish I've been taught by Neil Turok... He rocks! This is the book that got me hooked onto the Massey lectures, which will present me with many joyful insights in the future. In case the name is not familiar at once, as was the case with me, just remember the name of the Hawking-Turok theorem, which he already has under his portfolio. And Neil Turok's in his 40s! The storytelling is totally immersive, and yes I completely understand that a lot of it is due to the format in which the book is intended to follow, namely a series of public lectures. This is the book that got me hooked onto the Massey lectures, which will present me with many joyful insights in the future. In case the name is not familiar at once, as was the case with me, just remember the name of the Hawking-Turok theorem, which he already has under his portfolio. And Neil Turok's in his 40s! The storytelling is totally immersive, and yes I completely understand that a lot of it is due to the format in which the book is intended to follow, namely a series of public lectures. But a lot of it is also due to Neil Turok's intelligent breakdown of (almost) everything we have learned about science since the time of the Greek philosophers. (he doesn't touch much on biology, for obvious reasons, he's a cosmologist after all) His ability to present complex and sometimes tedious scientific facts and discoveries as a delicious lunch to be eaten and learned, is amazing! I can only envy the students who enroll in his "academy" in Africa, and are lucky enough to be able to feel this teaching. The book is important due to the very balanced ideology that is brought forward by Turok on the connection between science and society. He affirms that the most important thing is to educate as many people as possible in the greater scientific discoveries that make possible every technology today. He also stands firm on the importance to always have inquisitive mind, or as he puts it "to doubt constantly and to live with uncertainty" which could be easily seen if one is to delve upon the depths of quantum physics theory and its uncertainty about all physical. And finally, he makes the case for a more humane science, where the ideas brought forwards by the leading minds of the day in science would be connected to our humanity, such as our deep connection with nature. Just beautifully said, and what a down-to-Earth thinker! I had not heard of Neil Turok before, but as a book from the Massey Lectures it was sure to be thought provoking. While not as in-depth as some of the more popular recent physics books, it does illuminate the names of some researchers and scientists that I had not encountered before. Turok is enthused about the potential of recent finds in the field, and the book is incredibly up-to-date with summations of the recent CERN discoveries about the Higgs Bosun particle. There is s great deal of speculation that the information age will enable brilliant minds in third world countries to make their own contributions to the field of physics. Turok is involved in a school system in Africa to seek out the best minds and provide them with a space to learn and explore their own ideas. "With their vast information processing capacities, quantum computers may be able to monitor, repair or even renew our bodies. They will allow us to run smart systems to ensure that energy and natural resources are utilized with optimal efficiency. They will help us to design and oversee the production of new materials, like carbon fibres for space elevators and antimatter technologies for space propulsion." This was a fairly quick read, enjoyable as a refresher on modern physics and inspiring as a call to arms for more-- better!-- scientific discovery. I do feel as though the tone failed at times to toe the line between being layman-accessible and being fully explanatory. I was occasionally bored by what seemed to me to be over-explanations of simple classical physics, but otherwise occasionally overwhelmed by the complexity of string theory; being a scientist myself, I have a hard time watching de This was a fairly quick read, enjoyable as a refresher on modern physics and inspiring as a call to arms for more-- better!-- scientific discovery. I do feel as though the tone failed at times to toe the line between being layman-accessible and being fully explanatory. I was occasionally bored by what seemed to me to be over-explanations of simple classical physics, but otherwise occasionally overwhelmed by the complexity of string theory; being a scientist myself, I have a hard time watching details get glossed over. That said, it's hard to know the extent to which this issue was a result of some flaw in Turok's writing or editing, rather than simply the seriously challenging nature of the material. Simplification of string theory or M theory, for example, is no small feat. Moreover, I may not be the target audience for a book like this... I'm no physicist, but I know a little about a lot of scientific fields. I almost feel I should be reading less and less accessible books on these topics to satisfy my curiosity. Turok explains concepts clearly and conversationally. His approach is that science should be accessible to all and scientists should engage with those in the fields of history, art, literature, and music—we all share the same goal, to explore and appreciate the universe and cooperation is the way of the future. An incredibly inspiring book. An expansive look at what physics reveals to humanity, that manages to present a beautiful overview without completely shredding my brain. That said, it gets a point off for an odd and out-of-tune swipe at the Dawkins' brigade in the conclusion...as it chiding them for their bold temerity. I cried twice in the first chapter. I readily confess that I am not necessarily an optimist. When presented with a positive outcome in any given situation, I try to find ways it can go bad. Likewise, when someone paints a bleak picture of something, I try to find some good. I don’t know what that makes me, probably annoying, but I generally think that the best and the worst outcomes of any complex situation are equally possible. Neil Turok, however, is clearly an optimist. He also really likes science and believes in it, as a force to shape society for the best. His enthusiasm is well taken, but it also causes him to be a little scattered. Fostering access to science, cosmology, history of science and quantum computing are all broach upon in his book, and that is amongst other topics. It is a lot, perhaps too much. One proposal now being considered is to install highly sensitive biochemical quantum detector is every home. In this way, the detailed medical condition of everyone of us could be continuously monitored. The data would be transmitted to banks of computers which would process and screen it for any signs of risk. The results of any medical treatment and dietary change or any other intervention could be constantly gathered. Turok think this is awesome, that it will allow us to live longer, healthier lives and get better medical care. Perhaps he is right. But me, on the other hand, I see myself bitterly holding a chocolate bar and not being willing to eat it, for fear of my insurance premium going up; or I imagine a world where ads for salty snacks start to pop up on my feed at the very instant I crack a beer open... where my boss knows how many beers I had last night. Now nobody needs that! Nobody needs either an increase of the blurring of needs vs. desires that targeted marketing instill. Yet, Turok might still be right, he sees such data as being used for the common good; and I see it as being used for profit and turned into a hacker’s playground. In truth, it might probably be both. But we need people like Turok to chart the path, to structure and articulate a vision of science can and will improve everyone’s life. This is obviously an inconsequential passage in the book, but it might provide an idea of the perspective under which it is generally written. To be fair, I am certainly hopeful Turok’s vision comes to life. I appreciate and agree with him that science is a powerful force generally for the good, but also that science in itself is not quite enough for us to apprehend and understand the world we live in. I think Turok would agree with me on that. There is modesty in his optimism that I found most welcomed. This is a nice trippy book that swoops from formation of stars to the carbon and molybdenum in our bodies. There are many fascinating ideas and conjunctions, and it's fun to read. HOWEVER, right in the middle the author states, "Bodies are pulled to earth to a degree that is proportional to their mass.... Lighter animals accelerate less during a fall than do big ones for these same reasons." Wait a minute, this was shortly after a discussion of Galileo. Didn't he disprove this theory from the Tow This is a nice trippy book that swoops from formation of stars to the carbon and molybdenum in our bodies. There are many fascinating ideas and conjunctions, and it's fun to read. HOWEVER, right in the middle the author states, "Bodies are pulled to earth to a degree that is proportional to their mass.... Lighter animals accelerate less during a fall than do big ones for these same reasons." Wait a minute, this was shortly after a discussion of Galileo. Didn't he disprove this theory from the Tower of Pisa? I didn't find it as easy a read as suggested and I do have a fair amount of prior knowledge in these areas, but as a lay person not a scientist. Definitely still worth the read to gain an understanding of some of the areas of interest in today's physics. Maybe I just need to read it again! Definitely a book the geek in me enjoyed. It accurately describes the reasons people get drawn into the world of physics and studying the universe. It makes you want to go out and discover the answers for yourself. This was not an easy read by physicist Neil Turok. He describes in detail how technology around us was created by us. He explains quantum theory and all sorts of other scientific facts which were quite beyond me. All in all I still enjoyed the book. This is a well written book with clear explanations, and it is highly credible. Any information stated is presented in terms of the relevant facts, with the limitations clearly acknowledged. The CBC Massey Lectures are an annual series given by key thinkers, the latest series given by noted theoretical physicist Neil Turok. The Universe Within is an exploration of physics, from classical to quantum, where Turok takes us by the hand and guides us through the history of science right up to string theory and quantum computing. Turok’s easy style makes this book remarkably approachable: the tone is neither patronizing nor too complex so as to alienate the reader. The initial lectures begin with a review of humankind’s great scientific theories and discoveries, progressing naturally toward a kind of “who’s who” of physics. Yes, all the greats are here: Newton, Planck, Curie, Einstein… But more than that, Turok gives equal attention to some of the less famous physicists, who I am sure are just as well known in that field as their more public colleagues (I fear to name names and reveal my ignorance!). It’s a very good review if you want to brush up, and gives a great starting point for those who have an interest in the sciences but lack formal teaching. As he goes more in depth into the complex theories, Turok provides ample examples and analogies to help visualize the abstract in a more concrete way. Heck, even Einstein preferred a geometric, classical view of physics, so who are we to disagree? While the examples help, Turok also shows us why some theories can only be explained mathematically, leading us toward the paradigm shift from classical to quantum physics. This book definitely warrants a second read with a highlighter in hand. Thanks, Neil, for reigniting my scientific curiosity. This is the book from Turok's Massey Lectures series. I have an enriched reading experience with this one, since a) I've seen/heard him speak many times, so I can hear him in head and b) Perimeter Institute is 5 minutes away, so we get to go to PI lectures frequently. In this series of lectures, Neil covers a wide range of topics to do with Physics and Cosmology, but he does it in a Neil way - always tying it to human experience. Real people doing science. I'm pretty sure that Turok sees scientifi This is the book from Turok's Massey Lectures series. I have an enriched reading experience with this one, since a) I've seen/heard him speak many times, so I can hear him in head and b) Perimeter Institute is 5 minutes away, so we get to go to PI lectures frequently. I'm pretty sure that Turok sees scientific knowledge as fundamental to our future well-being, and our soul-being, in a way. Turok is also very interested in what's next. We know that quantum is changing everything (quantum computing, for example), and he argues that we need to get serious about tapping into all of our talent - wherever it may be (i.e. not just the West or the Far East, but in Africa too). I know outreach and science education are important to Turok, and his passion really comes through. The author is a scientist who works in the field of cosmology and string theory. This makes him uniquely qualified to write a mediocre popular science book, which he has done. He covers Einstein, relativity, big bang cosmology, the standard model, and string theory. I like that he stays away from anthropic arguments and multiverse explanations. Though, these topics are ever so lightly touched upon. There is an autobiographical theme woven in there. Blink and you'll miss it. After dishing out his The author is a scientist who works in the field of cosmology and string theory. This makes him uniquely qualified to write a mediocre popular science book, which he has done. He covers Einstein, relativity, big bang cosmology, the standard model, and string theory. I like that he stays away from anthropic arguments and multiverse explanations. Though, these topics are ever so lightly touched upon. There is an autobiographical theme woven in there. Blink and you'll miss it. After dishing out his favorite bits of the science, he pontificates in the last two chapters. One chapter is about the possibilities of quantum computation. No detail is gone into, and his perspective is dubious at best. He talks about Frankenstein, how analog audio recordings are superior to digital ones, and takes some time to hate on Lawrence Krauss and Richard Dawkins with an argument from thousand-year-dead philosophers. That last part was abominable, but whatever. Ah, science fact. Such a different kind of read from science fiction. This author falls into the 'endlessly optimistic' camp. He picks out anecdotes from physics history to paint a picture of geniuses and collaborators being inspired and confounded by the mysteries of each age. Up-to-date as of last year, it is quite interesting for its view on modern advances in cosmology. Good stuff, even though I disagree with some of his points (like how we're nearly done understanding the world. I have a feel Ah, science fact. Such a different kind of read from science fiction. This book is long on personal anecdotes and a bit shorter (than I wanted) on what quantuum physics actually might mean. Turok talks about quantuum computers, for example, but assumes that we all know how quantuum reality (is there such a thing?) will be applied to create the supercomputer of the future. Most of us need a bit more info on the technical challenges, and how these are being overcome. The limitations may say more about the limitations of the reader, of course. The science of today see This book is long on personal anecdotes and a bit shorter (than I wanted) on what quantuum physics actually might mean. Turok talks about quantuum computers, for example, but assumes that we all know how quantuum reality (is there such a thing?) will be applied to create the supercomputer of the future. Most of us need a bit more info on the technical challenges, and how these are being overcome. The limitations may say more about the limitations of the reader, of course. The science of today seems to flow out of advanced mathematics and those of us who don't have that will have limited comprehension. Still, we are the group that likely buys more books on the advanced physics, and are the target group that keeps the Perimetre Institute's lecture series selling out in minutes. Perhaps I was hoping for a bit more explanation on the quantuum world so I could pretend I have some small insight. Neil Geoffrey Turok is a South African physicist, and the Director of Perimeter Institute for Theoretical Physics. His work has been in the area of mathematical physics and early universe physics, including the cosmological constant and a cyclic model for the universe. Turok was born in Johannesburg, South Africa, to Mary (Butcher) and Latvian-born Ben Turok, who were activists in the anti-aparthei Neil Geoffrey Turok is a South African physicist, and the Director of Perimeter Institute for Theoretical Physics. His work has been in the area of mathematical physics and early universe physics, including the cosmological constant and a cyclic model for the universe.